has ever seen to one of its most luxurious. 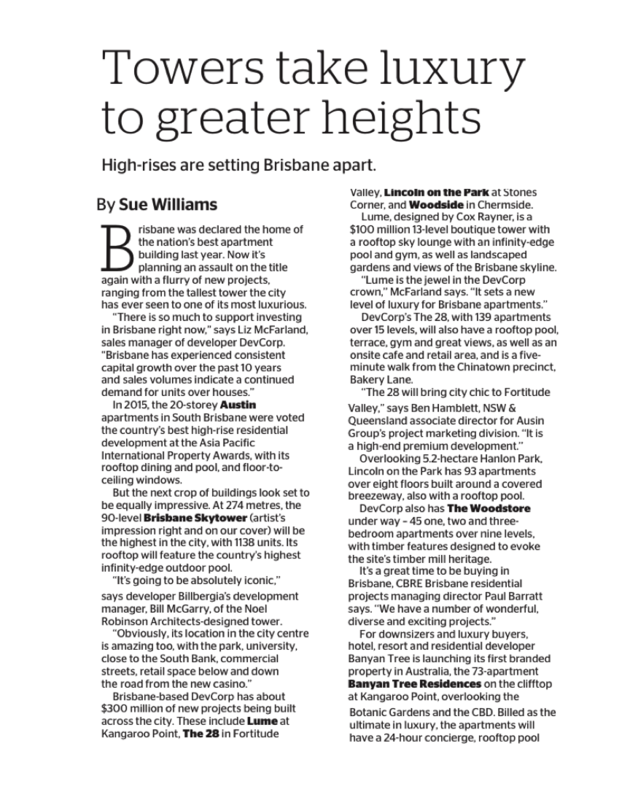 In 2015, the 20-storey Austin apartments in South Brisbane were voted the country’s best high-rise residential development at the Asia Pacific International Property Awards, with its rooftop dining and pool, and floor-to- ceiling windows. But the next crop of buildings look set to be equally impressive. At 274 metres, the 90-level Brisbane Skytower (artist’s impression right and on our cover) will be the highest in the city, with 1138 units. Its rooftop will feature the country’s highest infinity-edge outdoor pool. ‘‘It’s going to be absolutely iconic,’’ says developer Billbergia’s development manager, Bill McGarry, of the Noel Robinson Architects-designed tower. Brisbane-based DevCorp has about $300 million of new projects being built across the city. These include Lume at Kangaroo Point, The 28 in Fortitude Valley, Lincoln on the Park at Stones Corner, and The Woodstore in Chermside. Lume, designed by Cox Rayner, is a $100 million 13-level boutique tower with a rooftop sky lounge with an infinity-edge pool and gym, as well as landscaped gardens and views of the Brisbane skyline. DevCorp’s The 28, with 139 apartments over 15 levels, will also have a rooftop pool, terrace, gym and great views, as well as an onsite cafe and retail area, and is a five- minute walk from the Chinatown precinct, Bakery Lane. Overlooking 5.2-hectare Hanlon Park, Lincoln on the Park has 93 apartments over eight floors built around a covered breezeway, also with a rooftop pool. DevCorp also has The Woodstore under way – 45 one, two and three- bedroom apartments over nine levels, with timber features designed to evoke the site’s timber mill heritage. For downsizers and luxury buyers, hotel, resort and residential developer Banyan Tree is launching its first branded property in Australia, the 73-apartment Banyan Tree Residences on the clifftop at Kangaroo Point, overlooking the Botanic Gardens and the CBD. Billed as the ultimate in luxury, the apartments will have a 24-hour concierge, rooftop pool and garden, gym and spa, while three of the four penthouses will have its own pool. it comprises four buildings as well as gardens, two pools, a gym, lounge, theatrette and function room, with architects Rothelowman. and Ella in Newstead, comprising two buildings from Kokoda Property Group by architects Hayball with Chester as the first release. It will have 170 apartments over 15 levels, with 2.7-metre high ceilings. Looking around for an apartment for an investment, Ann Woo was horrified by Sydney prices, and when a friend told her she had just bought a one- bedroom unit in the city with no car space for $1.52 million, that proved the last straw. Then Woo, a mother of three, saw the plans for Billbergia’s Brisbane Skytower and was immediately impressed. She liked the idea of units right in the middle of the city, with the university nearby and the potential of plenty of tenants. a lower level for $440,000.